1. Bobby King - What Made You Change Your Mind? 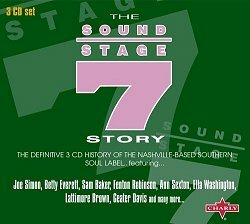 An excellent look at the Southern Soul label Sound Stage 7 and associated labels Seventy Seven, Sound Plus & Lunar. An often over looked southern soul sound of the mid 60's and 1970s, headed up by Nashville DJ and producer John Richbourg, once described as a white man with a black soul! This massive package is easily the best look at the label we've seen so far with a total of 77 tracks on 3 CDs, issued in March 2006. Plenty of deep soul, blues and R&B hits with many rare gems. A pity we are not treated to any label scans, however, a fascinating story is told in the accompanying 48 page booklet. Available on Charly 3 CD Box Set SNAJ 734.